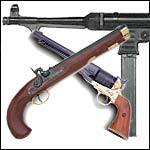 Our Firearm section includes Muskets, Pistols and Modern firearms including WWII. Safe non-firing but functional muskets, rifle, pistols . Great for collectors and re-enactors who wish to own real historic firearms without the worry. Bayonets for muskets and WWII rifles. Blank Firing Guns: Our authentic Blank Firing Replica Guns are ideal for re-enactment, theatrical are training purposes. Pistol Holsters and Pouches made from Quality top grain Leather for Civil War, Western and WWII Pistols. Safe Non Firing Modern Firearm Replicas.